On an unseasonably warm Saturday morning in late winter 2011 I packed a large panel and my paints into my truck and drove 3.7 miles to Fort Howard. I had stumbled upon this 47 acre parcel of federal property situated at the end of the Sparrows Point peninsula, near Baltimore, during the occasional drive or jog along a surprisingly rural stretch of road. Since the road that leads from my home to Fort Howard leads in the opposite direction of work, errands, friends, and family it was never on my way but remained on my mind. The majesty and decay of these places left an indelible impression on my mind. In summer 2013 I embarked on my sabbatical project at Fort Howard by preparing dozens of 2’ and 4’ square painting surfaces. 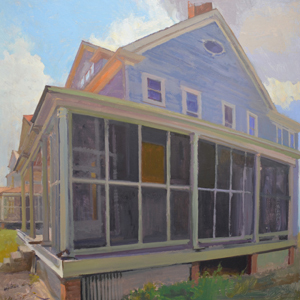 My full time pursuit during the summer and fall of that year was focused on the completion of a series of paintings documenting the structures situated on the Fort Howard grounds. Fort Howard, although largely unoccupied still maintains an outpatient clinic which is open on weekdays and is watched round the clock by security officers to prevent trespassing and vandalism. Leading up to this project I saw two deeply moving exhibitions which helped shape some of my goals. Richard Diebenkorn: The Ocean Park Series retrospective at the Corcoran Gallery and De Kooning: A Retrospective at MoMA. Both exhibitions confronted the viewer with an impressive sense of scale and various series of works that seemed to be directed by rigid self-imposed rules or restraints. Additionally both artists kept themselves from buttoning up or editing expressive aberrations that fell across the surface of paintings. It seems that these aberrations serve to balance the more ordered and deliberate marks on the paintings surfaces netting a gestalt effect that is both emotional and cerebral. With these ideas in the back of my mind I left my usual interior motif in the search of something new.